Deformation and ductility capacity depends not only on the detailing of members but on the Clauses 5.3.2, inherent ductility of their materials as well. Local deformation and ductility demands 5.4. I.I, 5.5.1.1 increase as the ductility class (and with it the value of q) increases. As a result, ductility requirements on materials increase with the ductility class. Because concrete strength positively affects member ductility and energy dissipation capacity in practically every respect (from the increase of bond and shear resistance to the direct enhancement of deformation capacity), Section 5 sets a lower limit on the nominal cylindrical concrete strength in primary seismic elements, equal to 16 MPa (concrete class C16/20) in buildings of DCM, or 20 MPa (concrete class C20/25) in those of DCH. No upper limit on concrete strength is set, as there is no experimental evidence that the lower apparent ductility of high-strength concrete in compression (due to which the values specified in Table 3.1 of EN 1992-1-1 for sc2 and ecu2 converge from ec2 = 0.002 and ecu2 = 0.0035 for concrete class C50/60 to a single value of 0.0026 at C90/100) has any adverse effect on member ductility and energy dissipation capacity. In primary seismic elements of buildings of DCM or even DCL, reinforcing steel should have a hardening ratio,/,//, of at least equal to 1.08 and a strain at maximum stress (often called uniform elongation at failure), esu, of at least 5% (both values refer to the lower 10% fractiles). These are steels of class B or C according to Eurocode 2, Table C.l. In the critical regions of primary seismic elements of DCH buildings, esu should be at least 7.5%, the hardening ratio of tensile to yield strength,///, should be between 1.15 and 1.35, and the upper characteristic (95% fractile) of the actual yield stress, /k 095, should not exceed the nominal yield strength,/yk, by more than 25%. The first two conditions are met by steels of class C according to Eurocode 2, Table C.l. The purpose of the lower limit on esu is to ensure a minimum curvature ductility and flexural deformation capacity, by preventing bar fracture prior to concrete crushing, or simply delaying it until a target flexural deformation is reached (see equation (D5.7)). The lower limit on /,// aims at ensuring a minimum length of the flexural plastic hinge, as theoretically the plastic hinge length, Lpl, is equal to the shear span, Ls, multiplied by (1 -My/Mu), with the ratio of the yield moment, M , to the ultimate moment, Ma, being approximately equal to fy/ft. Finally, the purpose of the ceiling on the values of/,// and/yk 0 95//yk is to limit flexural overstrength, and hence shear force demands on members and joints, as controlled by flexural yielding at the end of members, as well as the moment input from beams to columns (cf. equation (D4.23)). Strictly speaking, for buildings belonging to DCM the requirement for the use of steel of at least class B applies only to the critical regions of their primary seismic elements. As in DCL buildings critical regions are not defined, the requirement for the use of steel of at least class B applies throughout the length of primary seismic elements. As the local ductility of a DCM or DCH building should not in any respect be inferior to a DCL structure, the whole length of primary seismic elements of DCM and DCH buildings should have reinforcing steel of at least class B. 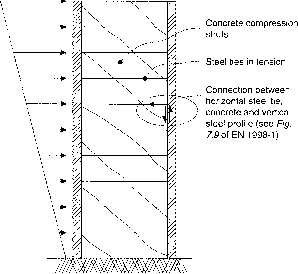 The additional requirements on the steel of the critical regions of DCH buildings essentially apply (1) thoughout the entire height of primary seismic columns, (2) in the critical region at the base of primary seismic walls and (3) in the critical regions near the supports of primary seismic beams to columns or walls (including the slab bars which are parallel to the beam and fall within the effective tension flange width defined in Fig. 5.3). Obviously, it is not easy to implement material specifications which differ in a certain part of a concrete element (its dissipative zones or critical regions) from the rest of its length. Therefore, in practice the requirements on reinforcing steel of critical regions are expected to be applied over the entire primary seismic element, including the slab it may be working with. 5.2.3.4(2)(a), force resistance and risking immediate or subsequent fracture. Concrete is not ductile, 5.2.3.4(2)(b) unless its lateral expansion is effectively restrained through confinement. 5.2.3.4(2)(a), hinges to the behaviour factor q used in the design. As the introduction of the system 5.2.3.4(3) overstrength factor aJa1 in the value of q produces a spectrum of continuous q values, the link between q and the local displacement and deformation demands has to be algebraic. The link is provided through the global displacement ductility factor, ¡j,s, linked to q through equations (D2.1) and (D2.2). It should be recalled that a (materials and elements) overstrength factor of 1.5 is already built into the q factor values given in Table 5.1 for buildings of DCM or DCH. So, normally, equations (D2.1) and (D2.2) should be applied using on the right-hand side the value <7/1.5 that corresponds to inelastic action and ductility. If q is used instead, a safety factor of 1.5 is hidden in the resulting values of ¡i6. where Ls is the shear span (moment-shear-ratio) at the end of interest and L , is the plastic hinge length. The latter is a conventional quantity, defined on the basis of the assumptions of (1) purely flexural deformations within the shear span and (2) constant inelastic curvature up to a distance from the end equal to L ,. Empirical relations are then fitted to L , so that equation (D5.5) is fulfilled on average at failure of the structural member in tests. In such an exercise, is taken as ©u/c6y and /j,0 as 0J9y, with the yield curvature (j>y computed from first principles, 6 taken as 0y = <f>yLJ3, and <pu, 0U as the ultimate curvature of the end section and the ultimate chord rotation (drift ratio) of the member. These ultimate deformations are conventionally identified with a drop in peak force during a load cycle below 80% of the ultimate strength (maximum force resistance) of the section or of the member. The ultimate curvature is computed from first principles, while the ultimate chord rotation is - at least for the purposes of fitting an empirical relation to L , - taken to be equal to the experimental value. JfJMPaj where h is the depth of the member and dhL is the (mean) diameter of the tension reinforcement. For the range of parameters Ls, h, dbh,fy and/c common in structural elements of buildings, the range of values of L , from equation (D5.9) is from 0.35LS to 0.45LS for columns (mean value 0.4LS), 0.25LS to 0.35LS for beams (mean value 0.3LJ and 0.18LS to 0.24LS for walls (mean value 0.21LS). These values are on the high side, because the Eurocode 2 model underestimates the ultimate strain, ecu, especially for heavily confined members; so ^ = <j)J<t> is also underestimated. To avoid propagating the bias further to ¡ie through equation (D5.5), equation (D5.9) overestimates L , with respect to the values that should be used along with a more realistic estimate of ecu. This option was chosen not only due to its simplicity but also for continuity with the ENV that preceded EN 1998-1, namely EN 1993-1-3. There, equation (D5.10) was behind the discrete values of ¡j,^ that were given for the three ductility classes with the then discrete values of q, the main difference with the approach adopted in EN 1998-1 being that the average of the outcome of equations (D2.1) and of the 'equal-energy' approximation: Ms = (<?2 + l)/2 was used for ¿¿5, irrespective of the value of the period T.
Within the full range of possible values of q for DCM and DCH buildings and the usual ranges of L , for the three types of concrete members, equation (D5.10) gives a safety factor of about 1.65 for columns, about 1.35 for beams and about 1.1 for ductile walls, with respect to the more realistic values provided by inverting equation (D5.5). These values presume that the full value of q corresponds to inelastic action and ductility. When it is realized that only <7/1.5 produces inelastic deformation and ductility demands, the average safety factor implicit in the demand value of ^ is 2.45 in columns, 1.9 in beams and 1.2 in ductile walls. This safety factor is increased further when the value of fj,^ is used for the calculation of the confining reinforcement required in the 'critical regions' of columns (see Section 5.7.7) and in the boundary elements of the 'critical region' of ductile walls (see Sections 5.7.7 and 5.7.8), as well as of the compression reinforcement in beam end sections (see Section 5.7.2). where T and Tc are as in equations (D2.1) and (D2.2), with both q0 and T referring to the vertical plane in which bending of the element detailed takes place. The basic value q0 of the behaviour factor is used in equations (D5.ll), instead of the final value q that may be lower than qa due to irregularity in elevation or a low aspect ratio of the walls, because these factors are considered to reduce the global ductility capacity for given local ductility capacities (e.g. due to non-uniform distribution of the ductility and deformation demand to elements in the case of heightwise irregular buildings). By the same token, in torsionally flexible systems a q factor value higher than that used to reduce the elastic spectrum should be specified for use in equations (D5.ll), as the elements on the perimeter of these systems may be subjected to higher ductility and deformation demands than the rest of the system; if this is the case, the designer is advised to detail the elements on the perimeter of torsionally flexible systems with additional caution and conservatism. This is not necessary for buildings characterized as inverted-pendulum systems, because with the already low basic values q0 of the behaviour factor, such systems will essentially respond elastically to the design seismic action. It should be recalled that the basic values of the q factor in Table 5.1 (as well as the final q factor value derived from them after any reduction due to irregularity in elevation or wall aspect ratio) represent the upper limit of q to be used in the derivation of the design spectrum from the elastic response spectrum. Even if the designer chooses to use a lower value than the upper limit he or she is entitled to for the ductility class used in a particular project, neither the required curvature ductility factor from equations (D5.ll) nor the prescriptive detailing rules for elements are relaxed. In recognition of the possible reduction of member flexural ductility when less-ductile Clause 5.2.3.4(4) steel is used as longitudinal reinforcement (cf. term involving esu in equation (D5.8)), Section 5 requires increasing by 50% the value of ^ over that given by equations (D5.ll), in the 'critical regions' of primary seismic elements where steel of Class B in EN 1992-1-1 (Table C.l) is used (as allowed in buildings of DCM). Nonetheless, because detailing measures that use the resulting value of refer to the ductility of the section as controlled by the compression reinforcement and confinement of the compression zone, this measure will not compensate directly for the possible reduction in ductility due to the use of more brittle steel. It may have significant indirect effects, though, by alerting the designer to the increased risk from the use of such steels and encouraging him or her to use steel Class C - or choosing DCL instead, where there is no penalty for the use of steel Class B, as design does not rely on ductility. As mentioned on pp. 102 and 104, the factor of 1.5 for overstrength of materials and elements which is built into the q factor value is not removed when q is used in equations (D5.8) for the calculation of ¡i0. In ductile walls designed to Eurocode 8, the lateral force resistance - which is the quantity directly related to the q factor - depends only on the flexural capacity of the base section. So, the ratio MRd/MEd - where MEd is the bending moment at the base from the analysis in the seismic design situation and MRd is the design value of the resistance under the corresponding axial force from the analysis - expresses the element overstrength. Section 5 allows calculation of ¡i0 at the critical regions of ductile walls using in equations (D5.ll) the value of q0, divided by the minimum value of the ratio MRd/MEd in the seismic design situation. It might be more representative - albeit less convenient at the design stage - to use instead the ratio ZMRd/XMEd, where both summations refer to all the walls'in the system. On the same grounds, a reduction of the demand value of ¡i0 in the critical regions of beams and columns due to overstrength might also be justified. But, unlike the plastic hinge at a wall base, which controls the force capacity of an entire wall, which in turn may be an important individual contributor to the lateral strength of the structural system, plastic' hinges in individual beams and columns are minor contributors to the global force capacity; so there is no one-to-one correspondence between the deformation demands on a plastic hinge and its flexural overstrength to support a simple rule for a reduction of the demand value of /./,, locally.